The VT110 is a flyable high output speaker providing high fidelity sound that ISP has become so well known for. The VT110 works excellently for Front of House systems foreground and background music plus music-plus-paging systems. 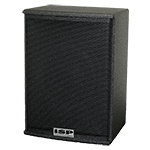 These speakers are ideally suited for a wide variety of applications including church installs, nightclubs, restaurants and any installation requiring a low profile high output cabinet. Many church applications require a low profile cabinet due to low ceiling heights. Choices are limited for a speaker capable of high output high definition with excellent clarity. The VT110 is the perfect answer and ships standard with internal fly-points on top and also includes a lower pull-back rig point. This cabinet can be ordered with either a vertical or horizontal orientation. The VT110 has excellent vocal clarity and dynamic impact. Combined with a subwoofer the VT110 provides a very high performance audio system.